Rico Blanco, vocalist and lead guitarist of Rivermaya, has reportedly left the popular band. Rumor has it that the talented singer-songwriter will pursue a solo career and will be known simply as Blanco. 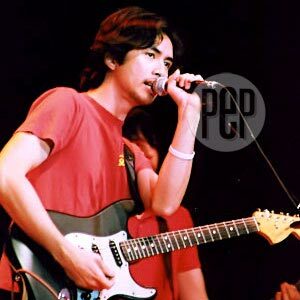 After weeks of talk and speculation, a reliable source confirmed to PEP (Philippine Entertainment Portal) through e-mail that Rico Blanco, vocalist and lead guitarist of Rivermaya, has left the prolific ‘90s band. The source, who is very close to the group, declined to elaborate on the real reason behind Rico's departure. The group is currently in shock. "But that's all I am ready to say at the moment. We are still reeling from the shocks," said the source. FINAL ACT. The hush got louder during the band's reported final gig last May 4 at the Metro Bar, with Sandwich and Pupil. In a message posted by The Dawn's drummer, JB Leonor, in their web mailing list, he said that guitarist Francis Reyes got a text message early in the morning of May 4, saying that Rivermaya was breaking up and would have their last show later that evening. Francis went to Metro Bar that night and texted JB after a couple of hours with: "Confirmed! It's Rivermaya's last gig!!! They're breaking up!" Spectators also noted Rico's happiness that night as he shared the bill once more with former E-heads members—Ely Buendia (now with Pupil) and Raimund Marasigan (now part of Sandwich). An intense Rico, in the middle of performing "Umaaraw, Umuulan" reportedly shouted, "Isang huling malupit!" Rivermaya's bassist Japs Sergio then seconded by telling the crowd, "Lakasan n'yo pa, huli na ‘to!" But after that fateful night, no official statement was issued by the management or by any of the band members to confirm the split. Until only recently. THE AFTERMATH. On the heels of Rico's departure is another rumor that the talented singer-songwriter will pursue a solo career and will be known simply as Blanco. Prior to Rico's decision to leave the band, Rivermaya had been doing very well in Southeast Asia, particularly in Indonesia and Singapore. As of the moment, there's still no confirmation on whether Rivermaya would carry on without Rico or just disband. There are unconfirmed reports claiming that remaining members—Mike Elgar (guitars), Japs Sergio (bass), and Mark Escueta (drums)—would be launching a reality-TV search to find a suitable replacement. The same move was done by Australian rock band INXS to find its new frontman after original lead singer, Michael Hutchence, was found dead in 1997. Some local music experts express their doubt regarding Rivermaya's future, citing the fact that Blanco was the main creative force that kept the entire band running even after some of its original members had left. "Rivermaya survived the departure of Perf de Castro, Bamboo Mañalac, and Nathan Azarcon simply because they're not the chief songwriter," said one music journalist. "Rico was the most important component of that band because he supplied the hits. It was the same when Ely (Buendia) left the Eraserheads. Much as the other members wanted to continue, they just found it hard to fill in that huge void," he added. Blanco authored most of Rivermaya's well-loved hits, like "214," "Bring Me Down," "Awit ng Kabataan," "Elesi," "Kisapmata," "Balisong," and "241," among many others.